Just what exactly does a ‘relationship’ with a vet involve? There have been volumes written about antimicrobial resistance (AMR) in recent years — this article will highlight some of the key points on how well the cattle industry is doing so far and what changes veterinarians may make in their recommendations going forward. For those of you who crave more detailed information, there are several very good brochures and websites with factual and current information on the subject. These are important when we are trying to explain to the average urbanite what we know and how the entire industry is really following the guidelines about prudent usage of antimicrobials. We hear the public and industry using terms such as ‘raised without antibiotics.’ This has severe ramifications from an animal welfare perspective and, simply stated, is the reason we have established withdrawal periods by law. These withdrawal periods ensure there are no antibiotic or other drug residues from things like NSAIDs (non-steroidal anti-inflammatory drugs) or vaccines in our meat or milk. 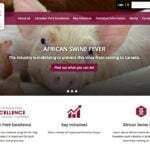 The best brochure I’ve seen is Worried about Antibiotic Use and Resistance in Cattle from Alberta Beef Producers (available at www.albertabeef.org by clicking on the Consumers pull-down menu). It explains the four main categories of antimicrobials from Category 1 (meaning they have very high importance in human medicine) to Category 4 (not used in human medicine). The brochure gives examples of Category 1 antimicrobials we use in cattle, such as Excede or Baytril. The very high and high category make up no more than one to two per cent of the antimicrobials used in cattle production. But we must still think twice before we use them. They should only be used for severe medical conditions, such as bad pneumonia. Veterinarians are continually advising that the least critical category is still likely to work on the condition at hand. I have included a chart that compares the different classes of antibiotics used in cattle versus other species versus humans. You will see a big difference, so have a close look. In dealing with cases in which there has been no response to drugs that previously worked, veterinarians are having more cultures done. This means the lab grows the bacteria causing the illness and then uses little discs impregnated with antibiotics to actually see which ones work. This gives us a much better scientific approach to treatment and should provide a higher success rate. The issue is this takes a couple of days to do, so in the meantime we as veterinarians must prescribe treatments, which are often based on previous protocols and success rates. The possibility of resistant bacteria passing from cattle to humans is very remote because Category 1 drugs are so rarely used plus the fact that resistant bacteria would need to get through the packing plant and all the precautions they use (such as steam sterilization, UV light, and a very clean environment through the cooking process) and into a person, who would then have the antibiotic prescribed by the doctor and not work. This is a very, very unlikely chain of events. There is now a research cluster (headed by Dr. Tim McCallister and including researchers from the cattle industry and veterinary colleges) looking at all these potential pathways to make sure all possibilities have been looked at. This alone is very positive evidence that the industry is doing its due diligence to protect livestock production and people. 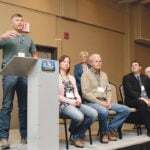 A great quote from veterinarian Dr. Craig Dorin of Airdrie is, “It is our privilege and not our right to be able to use antibiotics in the animals we take care of.” Because of all the industry surveillance, drug resistance levels are very low in beef. That doesn’t mean they can’t increase and generally if resistance is found, the bacteria are resistant to most antibiotics in the same family of drugs. Veterinarians know this and will prescribe a different family of antibiotics if need be. This year, your veterinarian will be much more involved with antimicrobials that are used in production animal medicine, especially those that were non-prescription for the most part but administered in the feed or water. More than 75 per cent of the drugs are used in feed, so enhanced oversight at this level is where you as producer will see the most changes. These are all steps that will be positive in reducing antibiotic usage where possible and using the most effective ones for the condition at hand. The first thing removed from antibiotic labelling is the growth promotant indications. Increased growth from reduced disease incidence is often a secondary benefit but your veterinarian will need a medical reason to prescribe. A great resource on AMR is the Beef Cattle Research Council website. It has clear information as well as a seven-minute video that everyone in the cattle industry should watch. We need to get back to management practices we know will minimize sickness and hence antibiotic usage, especially giving calves adequate quality and quantity of colostrum (colostrum is the best ‘drug’ one can use), low-stress weaning, and pre-immunization up to two weeks before weaning. As well, more direct movement of cattle through satellite and internet sales eliminates lots of commingling. All these practices can definitely reduce the labour to administer, the cost, and the usage of antimicrobials. I know that in some ways, it is easier said than done. 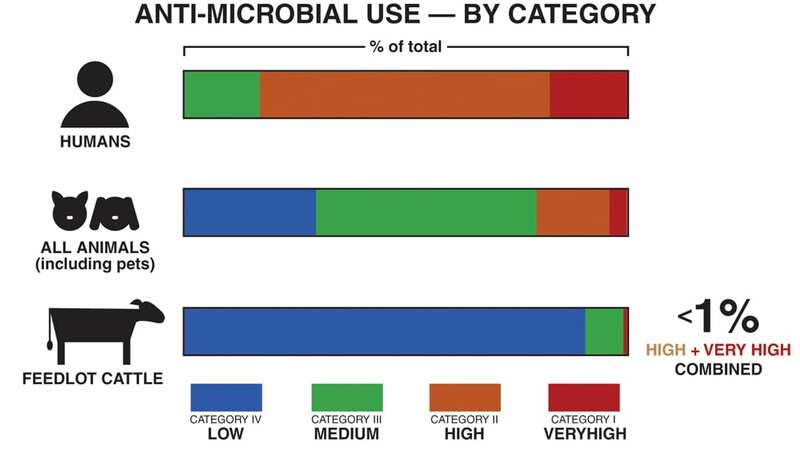 But the potential for reduction in antimicrobial usage is great. Pharmaceutical companies are focusing more and more on vaccinology so you will see broader coverage vaccines for viruses and bacteria. Intranasal vaccines can provide quicker coverage, and technology has and will improve the degree of immunity and length of coverage over time. In the future, we will most likely see more vaccines replacing antimicrobials. A good rule for raising cattle is that it is far better to prevent by management and vaccination than treat with antibiotics. 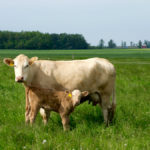 Watch the parasite treatments as keeping them greatly reduced in your herd will also stimulate the cattle’s own natural immune system and along with proper nutrition minimize sickness. 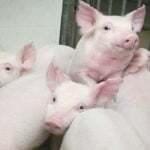 With increased usage of antibiotics there is increased resistance in that species so the veterinary communities’ oversight will focus on four things: Prevention, Production, Control and Therapy. Another website worth checking out is www.raisedwithcare.ca (created by the Alberta Veterinary Medical Association). This website is very interactive and there are some quizzes you can take to test your knowledge. The questions you get wrong become an educating experience. I encourage you all to check out these reference sources and tell the public so we all together in the cattle industry can do the right thing and be leaders and educators in helping with the global battle against AMR. Generally speaking, we are already doing a good job but there is always room for improvement. So question your veterinarian and yourself and ask if there is a better way if antimicrobial usage seems too frequent on your operation. Responsible antibiotic usage is not about residues; we already do a fantastic job at that. It is about using the right drug for the right bug and for the right length of time. Take pride in the fact the cattle industry is, in many ways, taking the lead and the medical profession can learn a lot from what you do. Tell your story. Many times painkillers, supplements, vitamins, or minerals — rather than antimicrobials — may be the therapy of choice. Prevention of the disease through vaccination, low-stress weaning, and not commingling cattle can also greatly reduce the usage of antimicrobials. In specific instances we may be able to actually lower drug costs and have better outcomes while at the same time not contributing to any resistance. There will be lots more on this topic in the future, so stay tuned. Tell a neighbour about the fact that all antibiotics will require a prescription as of Dec. 1.